These Gluten Free Classic Potato Latkes are just like grandma makes them, only made without any refined white flour! They have the classic delicious flavors you want, and I guarantee that nobody will know they are gluten-free! 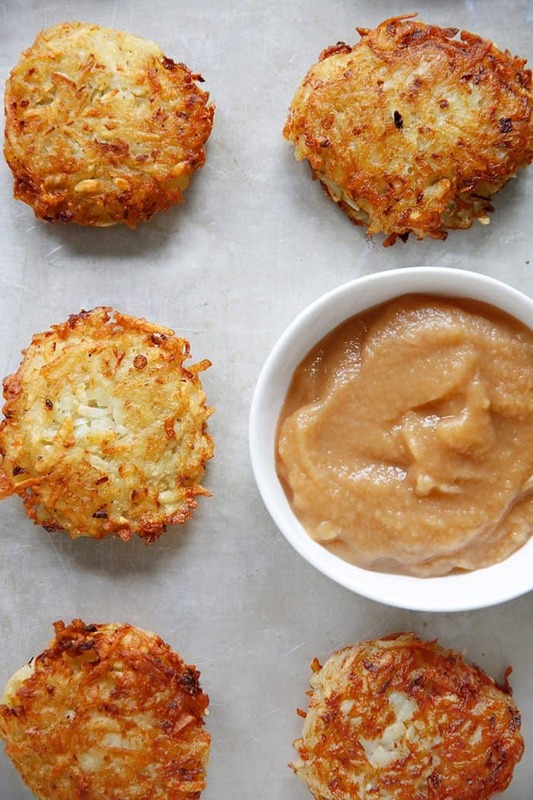 How do you make potato latkes? Peel and grate the potatoes and onions Place strained mixture into a large bowl. Add in everything else and mix well. Place oil into a large pan and heat the oil on medium-high heat. Once oil is hot, make patties out of the potato mixture (squeeze out even more excess liquid as you make patties) and pan-fry until brown on both sides. Should take about 3-4 minutes on each side but watch closely to avoid burning. Add more oil as needed. Serve with applesauce or sour cream and enjoy! 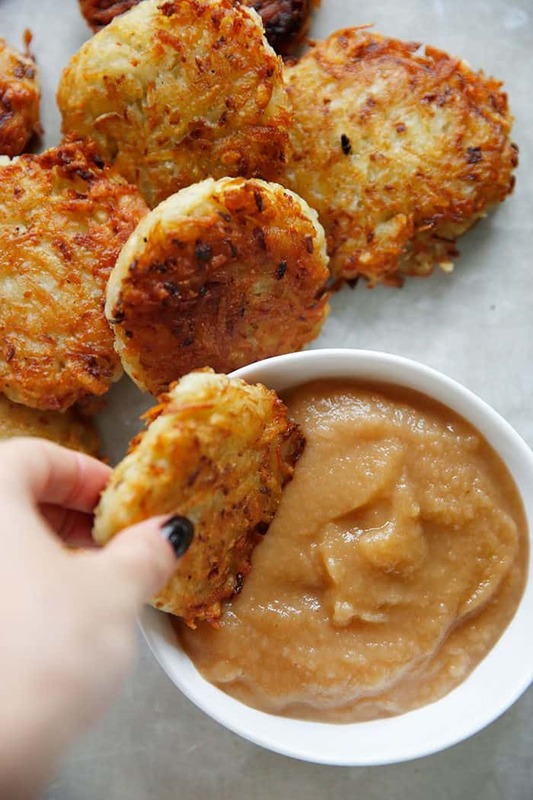 Do you eat your latkes with applesauce or sour cream? I’m applesauce all the way, and I love making my own! It tastes so much better! 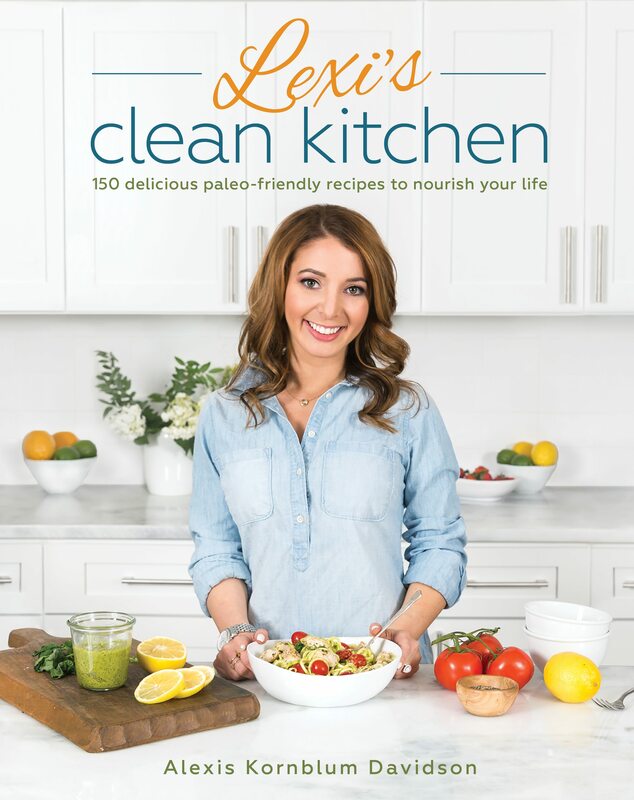 Find the applesauce recipe in my cookbook, which is now on sale for $14 (60% off)!! Don’t wear a shirt you care about while making these! Haha. Make a tiny one to test in case you want to adjust salt for remaining batches. I keep my strainer near by so I can strain extra liquid as needed. After grating potatoes, place into a bowl of cold water. This helps bring out some of the starch! 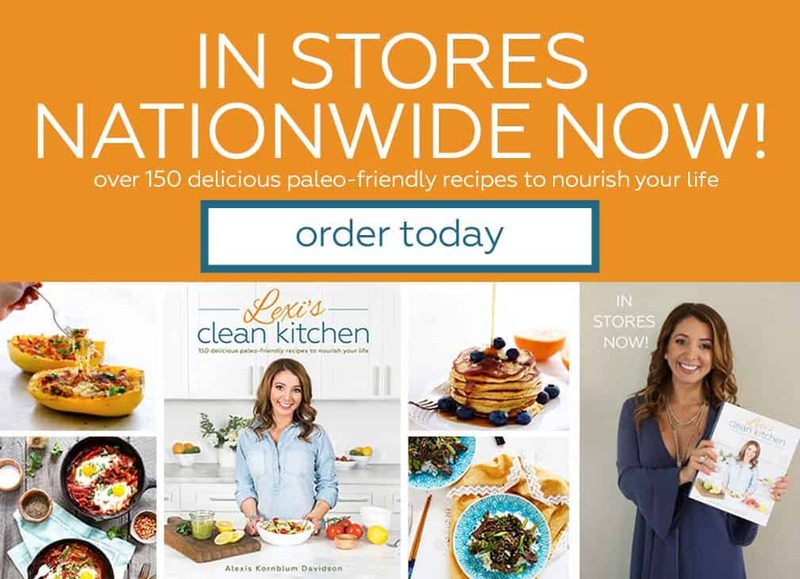 Do I need to peel potatoes for latkes? Wash and scrub the potatoes if you want to keep the skins on, or peel them! 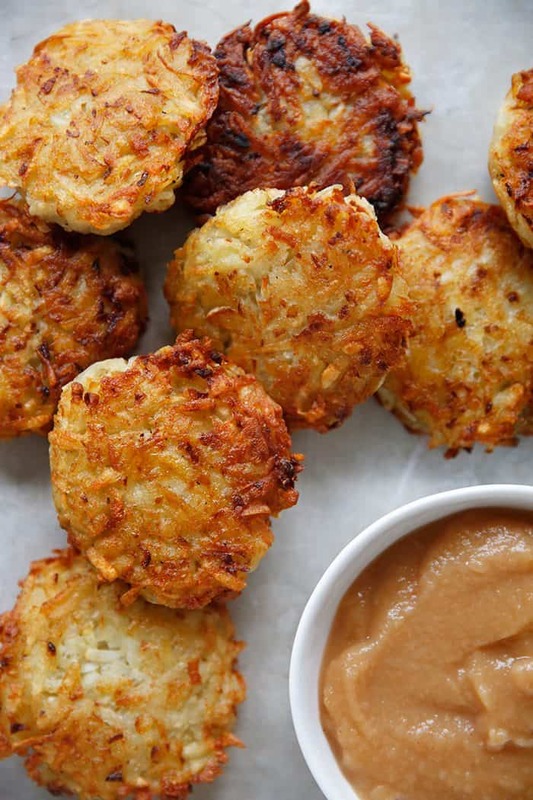 Can you make potato latkes ahead of time? 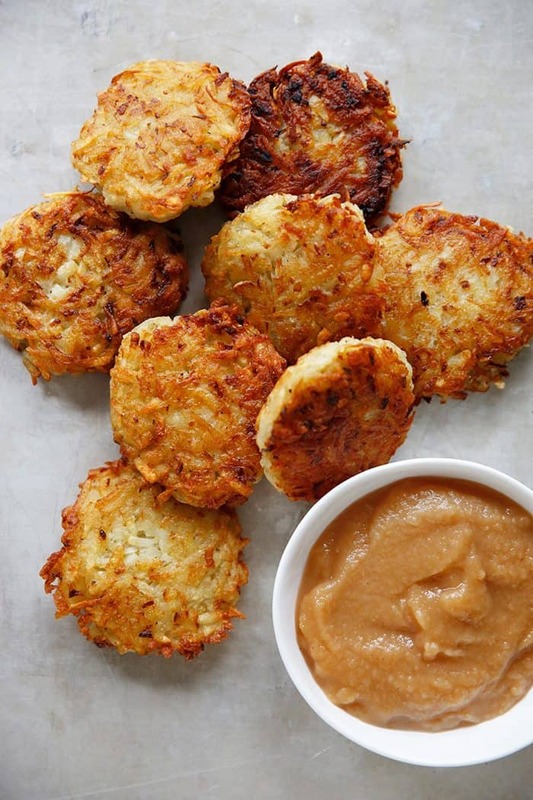 Fry the latkes an hour or two ahead, place them on baking sheets in a single layer, then re-heat them in the oven when ready to serve! Peel and grate the potatoes (you can use a food processor or grate by hand) then place in a bowl of cold water and set aside. Peel and rate the onions. Add both grated mixture to a fine mesh strainer lined with a cheese cloth if you have, and strain as much excess water out as possible. Place strained mixture into a large bowl. Mince garlic and add it to the bowl with the potato and onion. Add in the eggs, arrowroot flour/starch, salt and pepper. Mix well. Place 1/2 cup of oil into a large pan and heat the oil on medium-high heat. Once oil is hot, make patties out of the potato mixture (squeeze out even more excess liquid as you make patties) and pan-fry until brown on both sides. Should take about 3-4 minutes on each side but watch closely to avoid burning. Add more oil as needed. 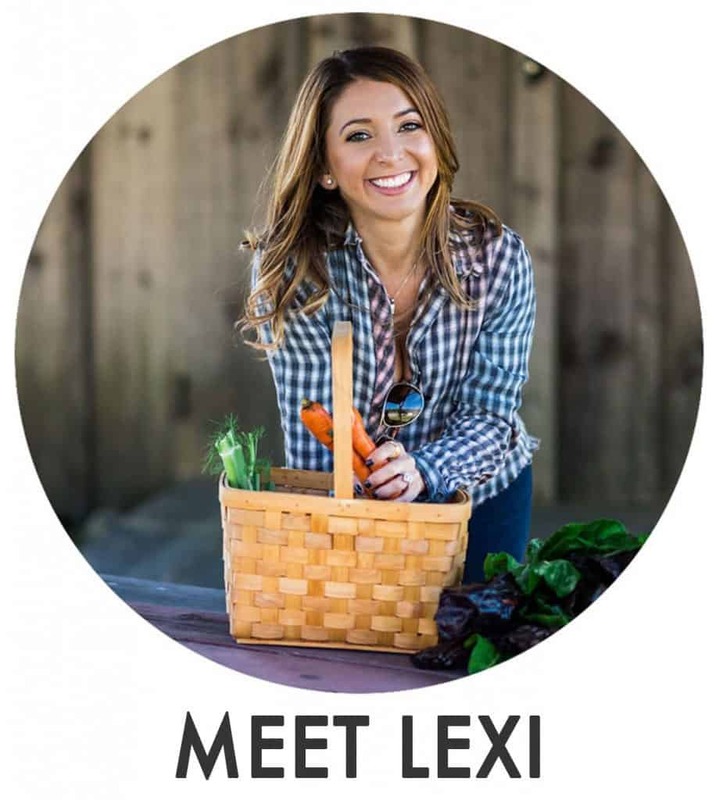 Paired with the Homemade Apple Sauce in the Lexi's Clean Kitchen Cookbook! If using a food processor to grate potatoes/onion, don't over process! That’s what my husband says! I made these with sweet potatoes, and they were so good especially topped with bacon, poached eggs and Hollandaise. I can’t wait to try them with white potatoes (this weekend!). Thanks for a super tasty recipe!